The game of hurling is more than just a game -- it is Ireland's national passion. But to appreciate hurling, one must look beyond the mere fact that it is a sport, because it is much more. Countering the trend towards big-money professional athletics, hurling has remained strictly amateur. It is a game played purely for the fun and history of it. It is a game woven deeply into the social fabric of the Irish people. Which is amazing when one considers just how extraordinarily dangerous the game is. First, the basics. Hurling is best compared to lacrosse. 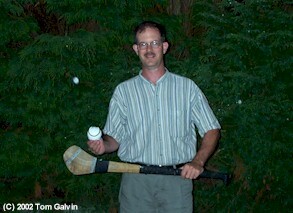 Hurling is an outdoor ball-and-stick game played with fifteen players on a field larger than a soccer pitch. Whereas lacrosse is played with netted sticks, hurling is a played with a flat wooden club, and the ball is struck by swinging the stick vice flinging it as in lacrosse. Hurling players can catch and carry the ball in the hand, but can only pass it by hitting it with the stick, kicking it, or slapping it by the hand. As you can surmise from the first photo, the object is to drive the ball either into a soccer-sized goal or 'over the bar'. A goal is worth three, over the bar is worth one. The common tactic is to accumulate single points, chasing goals only when a clear opportunity presents. An average senior-league score would be about 22-18, with three-to-five goals averaged per game. There's little equipment involved. The second photo shows me holding a hurley and the ball. The ball is fairly soft, even softer than a softball, which is good because the ball is sometimes traveling at pretty high speed among the players. Helmets are commonplace, but not required, and many players didn't wear them until the last decade. Although the risk of injury is great (imagine getting smacked full force by one of these sticks! ), they aren't as common as you think. Of course, when they happen, they can be pretty nasty -- missing front teeth are common among players. The reason they aren't common is because the game is played honorably, and this is where the game's amateur status is very important. The players play for pride, not money. They play the game hard, but fairly, and they are careful with their sticks (but not at the expense of the play). The referees are strict and respected. And when the game is over, any bad blood is left on the pitch, and the players exchange their uniforms for factory clothes and return to work the next morning. And when their playing days are over, they merely hang up their hurley and continue their working lives unless they elect to become the team manager. Amateurism keeps the game within reach of the average fan. Most games are free or minimal admission and played on the local radio station. Games are played at the local sports club (I recall once watching a game where they had to move the cows off the pitch and off to the nearby pasture). Each borough, town, or collection of towns has a club, and club leagues are run at the county level. 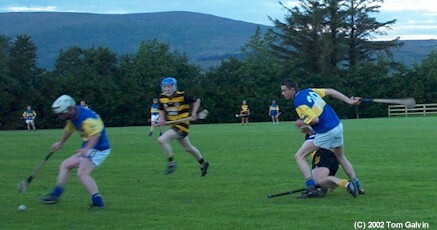 The third photo shows an example of a club match between the lads from Portlaw (in blue) playing a neighboring town Colligan. Games are almost always held on a Sunday afternoon over the spring and summer, and normally played on only certain weekends. That's because players not only represent their home towns in the local leagues, the best compete for a spot on the county team that plays a concurrent season. These county teams play against other counties within the province. The four provinces of Leinster, Munster, Ulster, and Connaught stage their own league. The winners square off in the All-Ireland championships. One can liken this system to that of European soccer leagues, where the national leagues play on some weekends, while other weekends are reserved for international matches only involving some of the players. The total number of matches is small. County leagues only have about a ten-game season, followed by championship tournaments. Yes, this means every game counts -- not like individual baseball or basketball games in the US, whose leagues play inflated schedules in order to pay for their players' salaries. But that's not to say the All-Ireland championships aren't big business. The 2002 championships will be played in the newly-constructed Croke Park facility in Dublin. This stadium seats 86,000, and will be filled to capacity, with tickets going for 35 Euro and up. National coverage of the championship rounds utterly dwarfs any other sports coverage in the country. Still, I would adjudge the coverage to be very low-key. The images of the lads from Waterford, Clare, Offaly, and Limerick are very boy-next-doorish. Their words are carefully measured -- there is no expression, not even a hint, of ego involved. This is hardly packaging. As my relatives and me wandered around a parade in downtown Waterford, we encountered a couple of Waterford's key players. They were just faces in the crowd enjoying the parade like the thousands around them. No posse, no sunglasses, no attitude, just good honest lads that you'd want to raise a pint on any given night. There are two other noteworthy aspects of hurling that add to its character. First is the fact that the equipment is manufactured the old-fashioned way -- by hand, and by small hometown operations. The fourth photo was taken from a hurling ball factory in Portlaw, one of only a handful in the country. This factory is only a four-man operation, occupying a crammed room in an old schoolhouse. 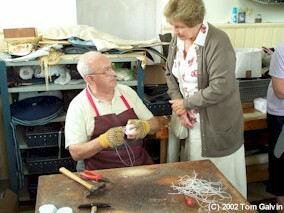 Leather, cork, elastic strand, and thread are brought in and manipulated using simple machinery. There is no assembly line. This means the products are both high quality and largely unchanged from years past -- no 'souping up' like with modern baseballs. The other aspect is in the youth leagues, who do not play a watered down version of the game. 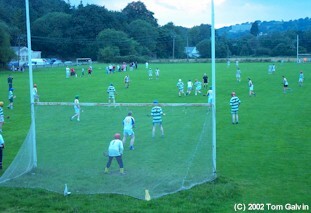 The fifth and final photo shows an under-14 game being played, and leagues are played as young as under-10. Apart from changes in the size of the field and equipment, the game is played exactly the same way, baseball swings and everything. To Americans who have generated watered-down versions of sports for application in youth clubs, this might seem horribly perverse. Yet, safety and respect for the opponent is bred into these lads at a very young age. This leads to greater respect for the game at later ages. Oh by the way, hurling is also played by women (and girls). The ladies' variant of hurling is called camogie, but the only real differences in the game concern the size and weight of the equipment. Camogie is every bit as rough as hurling. Budding fashion models need not apply. Hurling is a great game, not just because it is a great game by itself, but because it seems to illustrate the best of Irish culture -- its folksy character, its work-hard and play-hard virtues, and its community-based values. Given a choice between two national pastimes -- baseball and hurling, I'll take me pint of stout and curl up pitchside for a game of hurling any day. Perhaps soon, enough Americans will agree after all those work stoppages, drug charges, fan abuse, and spitting at umpires.